DJ Johnny K Sound Systems / Karaoke Buffalo NY has karaoke rentals for the Buffalo, Niagara Falls, and surrounding Western New York area. Call us when you’re looking to rent a karaoke machine to liven up your party or event. Great music brings people together more than anything at a party. KARAOKE can turn a great party into a spectacular event with the power of music entertainment …sung by your guests! Our KARAOKE show offers an extensive collection of the best songs ever recorded. The finest in KARAOKE music tracks are played through our complete & professional system. You and the guests select the melody and go with your own vocals! An experienced entertainer will warm up your crowd to make them feel at ease. Singing in groups is also encouraged for those guests who have never sung KARAOKE. This is a musically fun way for everyone to participate at your party. We will not force anyone into singing. It’s fun for everyone to enjoy with no pressure. Even people who don’t sing will take pleasure in listening to musical favorites sung by their friends! Our KARAOKE show is also available for weekday promotions like Grand Openings, Mall Promotions, School Assemblies, Car Shows, Kids Parties, Senior Citizen Centers, Retirement Homes, Community Centers, Political Fund-raisers and more!!! Let the DJ JOHNNY K KARAOKE SHOW transform your next event into a fabulous fun filled time with the power of KARAOKE. When you book our KARAOKE service you will have access to music selections for all ages to enjoy. Included are Golden oldies, rock, country, show tunes, classics, disco as well as today’s top hits. You will be amazed at the sound quality of our professional state-of -the-art show. Don’t be confused with rental units or home KARAOKE machines. 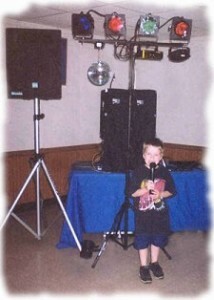 You are hiring a Professional KARAOKE Sound System and entertainer. Check our availability or call (716) 472-9898 to book your show today! Karaoke Buffalo NY, WNY, Niagara frontieer!